Developing a healthy soil is the goal of every gardener, but sometimes plants need an extra boost. Perhaps you are growing high-yield fruits and vegetables, plants with big blooms like roses, rhododendrons and camellias, or just feel that your soil isn’t performing well and your plants need a little help while you work to balance it with compost and other approaches. 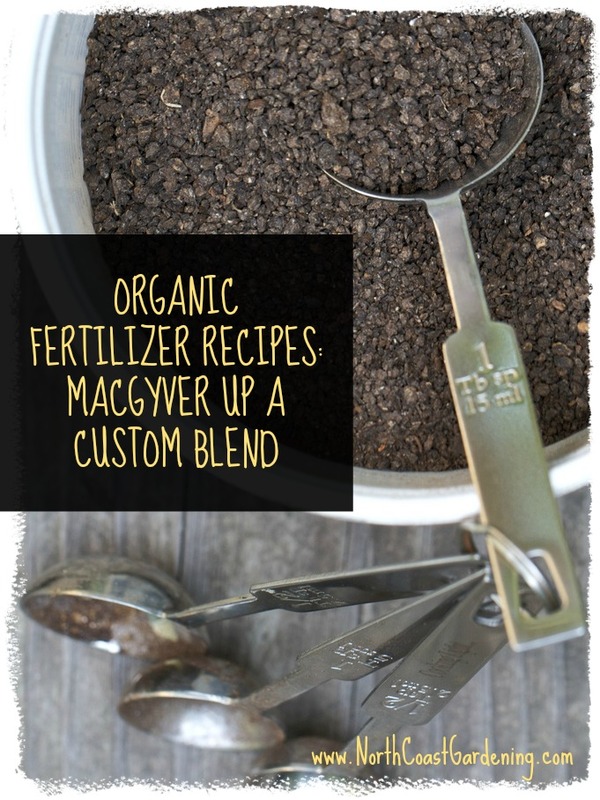 In any case, creating your own organic fertilizer blend from single ingredient fertilizers is a great way of saving money and keeping control over what exactly goes into your garden. I would think that in using single ingredient fertilizers, you would also have the opportunity to learn more about your plants, as you watch their response to what you add and learn to find the proper balance of nutrients for your own garden over time. In this article, I’ve compiled a few recipes for you to DIY-up, including a basic mix, one for shrubs, one for roses, and a veganic blend for those of you interested in a kinder approach to soil fertility. Some ingredients which are used in all purpose or specialty fertilizer have a more specific purpose, but these are some basic ingredients that are in most blends. Lime: If you use a seed meal, it tends to run acidic, so lime should be used to help maintain a balanced pH. There are two types of lime, dolomite limestone and calcitic limestone. Dolomite consists of half calcium carbonate and half magnesium carbonate. The calcitic limestone is made of calcium. Your plants in your garden will need more calcium than magnesium, so you can mix 1/3 dolomite with 2/3 calcitic for a perfect mixture of lime. Bone Meal: Bone meal is a by-product of the beef industry and is the main source of the phosphorus component. When bone meal is used in a recipe, it releases phosphorus (P) quickly into the soil. Kelp meal: Kelp meal is made from seaweed and is rich in potassium/ potash (K). It also contains assorted micronutrients; but it is on the expensive side. The good news is that you don’t really need a lot of it to make up a fertilizer. Greensand: Greensand is composed of glauconite, a blue-green mineral that is rich in micronutrients. Greensand can absorb up to one third of its weight in water which will help improve the moisture in your garden soil when used. Seed meal: This can be cottonseed meal, neem seed meal, or alfalfa meal and will provide nitrogen (N) for the soil. Blood meal, feather meal, and fish meal are other nitrogen sources. Below are some recipes for all purpose fertilizers. If you buy the ingredients in bulk at the nursery (either scooped from bulk bins or in large sacks), it’s more cost effective. And if the ingredients are stored properly in labeled plastic containers and kept dry, they will still be usable for years. You can use anything you like as a scoop: a cut up milk container, a plastic pitcher or even a margarine container (I like TubTrugs to hold it as I disperse). If you’re mixing a large amount, use a wheelbarrow to hold all the ingredients and mix it up with a hoe, and then you can appropriately store it. Now, when using any fertilizer in the garden, you may want to fertilize plant by plant unless you have beds of the same types of plants. Since each type of plant has different fertilization needs, it could be wasteful and possibly harmful to your plants to do otherwise. Use a half cup to 2 cups fertilizer per plant sprinkled around the dripline. Use the smaller amount for perennials, up to two cups for larger shrubs. Mix ingredients together and fertilize as needed. Use between a half cup and 2 cups per plant sprinkled around the dripline, depending on the size of the plant. When making your own organic fertilizer recipes, there are also specialty fertilizers which can be used at planting time and as a topdressing mid-season. These fertilizers are used at ½ cup per transplant or you can use 5 pounds per 100 square feet or 100 row feet in your garden. This blend works best at the start of the season and in summer when soil temperatures are warm. Rock phosphate can take a year to begin breaking down in the soil, so you can use colloidal phosphate the first year if needed for a faster source. DIY fish emulsion: You need a strong stomach for this one, but if you have no sense of smell or a very well-developed sense of adventure, this is a good one to try. Mix up the following: 1 part fish (guts, bones, heads, leftovers, etc) to 2 parts water. Place in an airtight container and then sit the container in a sunny spot in a remote area. Stir gently every two days and then apply in two weeks. If you can get past the smell, it’s a great source of phosphorus, amino acids, nitrogen and potassium and can be applied as a foliar treatment for cole crops and other leafy greens. Just wear clothes you don’t care about when spraying it on. Good grief the stuff stinks. Fish tank mix: Mix dirty untreated water from your freshwater fish tank with ashes from your fireplace. Don’t use this mixture around acid-loving plants or in alkaline-leaning soil as it can increase alkalinity. This is a rich brew containing nitrogen, phosphorus, and potassium with calcium carbonate. Don’t forget that the best place to start is with a soil test to find out what nutrients your plants and soil actually need. Once you have an idea of what is going on in your own soil, you can adjust these recipes to suit your own needs and that of the plants you are growing. Really good info and recipes! Love the DIY fish emulsion, needed a good laugh this morning. Thanks for the fertilizer recipes and the descriptions about what each component in the recipe does. Very helpful. I’m a little wary of cottonseed meal, which may contain a lot of pesticide residues. I have found that the best additive to soil at my place (which is tired thin dairy farm soil on top of draining leaching sandstone) is volcanic rock dust, which seems to make available quite quickly all the mineral micronutrients without a need to try to guess the balance. I mix manures, including from own hens… and prefer to put all manures through my own black plastic composter which teems with worms. I also have an old plastic garbage bin into which I put weeds and some manure items and top it up with water. A scoop of this rather smelly substance into buckets or watering can and you have a fine pour on feed. Steadily, steadily, especially with the volcanic rock dust in quite small quantities having profound effects, giving plants vigour and bringing in worms from some distance, I build towards a closed system, moving away from constant importation of commercial products. Organic I define as achieving, over time, a soil which is better than you started with. The key to the future and to plant resilience. I Love the recipes, Ill have to give one or two a try. Im usually planting rather large areas so some might be to expensive and cheaper to purchase an already made blend. Ive had very good luck with a shrimp and sea weed blend. These recipes seem pretty easy to make! I’ll for sure have to try some of these out once it warms up a little bit. For my garden, I would probably go with the high-nitrogen fertilizer one. Would it be a viable option to combine fertilizer I made with something that I bought from the store? I have been loving these recipes to be more in control of what I feed my crops. So thank you so much!! I am wondering if you would have a recipe for citrus and avocado? I am looking to create something in line with the E.B. stone Citrus and Fruit Tree Food, which is 7-3-3. I have obtained most of the ingredients from your list with definitions. Very helpful information, thank you. I will make my own potato fertilizer next year. Do you possibly have fertilizer recipe for acidic loving plants, like blueberries?